Ever since I started diving into studio photography the term “V-Flat” has been a big mystery to me. Google and YouTube have been the quintessential resource for photography knowledge and for whatever reason there isn't much detailed information on how to construct a V-Flat or what purpose they actually serve. It took time to sift through the noise of nonsensical DIY fabrication and even more time to unfold the enigma of this studio essential. In preparation for this article, I asked around the photo community and many photographers knew of the term “V-Flat” but most had no idea what purpose they served or how they were made. Apparently, there is a grand perception that V-Flats are an elusive tool that only big studios and professional photographers can access, as you can’t buy them as your local camera store. For me, it all started from seeing these huge Flats in play. 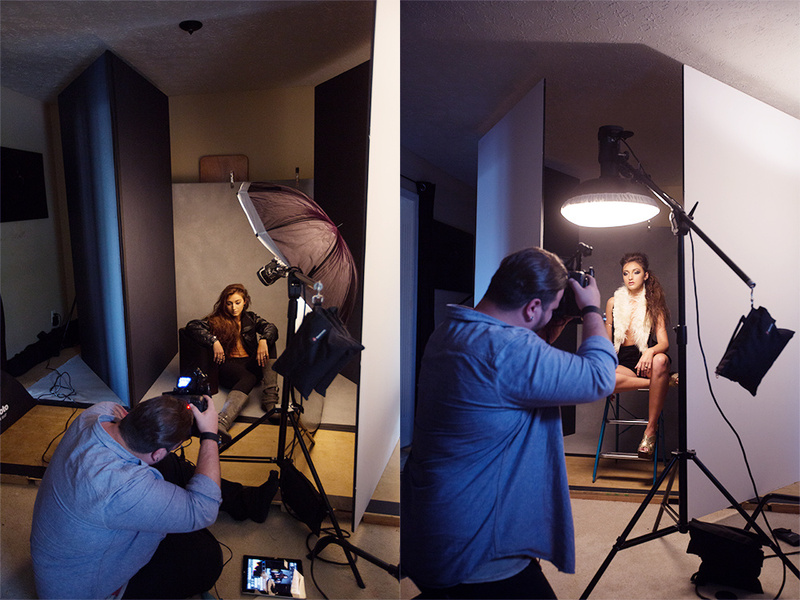 I had witnessed Sue Bryce create magical natural-light portraits with her versatile V-Flats and my friend Josh Eskridge incorporate his DIY foam Flats in a series of incredibly unique light setups. I had to step up and make it happen. Construction is quite easy, but the most important thing is making sure you have ample room to do it. I have a very small living room studio, so it took some cleaning and "Tetris" to put the flats together. If you need to go outside, then go outside. Remember, you’re dealing with 8 foot pieces of foam board that should be handled with care. After a day or two of phone calls and an deep exploration of the internet, I found the answer to what is the biggest conundrum of this whole construction; where to purchase the Flats. 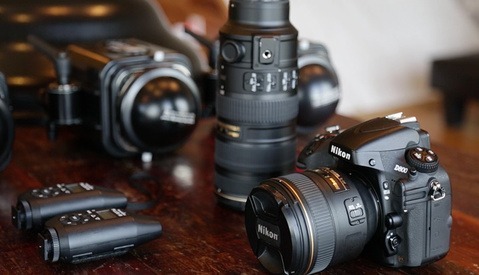 As photographers, it’s important for us to network and know people. If you purchase prints of any kind in your local market and happen to know someone who is employed at that lab, that person will probably know someone at a sign company or plastics distributor. Ask around or make some cold calls, you're bound to find some information. Just pick up the phone or draft an email to a local sign company. Foamcore is lightweight and can be easily cut, but apparently it can breakdown and puncture with ease, therefore on the advice of my contact, I found Gatorfoam Board. Gatorfoam is high-quality polystyrene bonded between two layers of wood-fiber veneer and it’s dent/scratch resistant. Gatorfoam can come in various sizes, thickness, type, brand and color, so it’s important to know what you need before you call. In this case we need a solid thickness for strength and a Flat that is reversible, matte black on one side and matte white on the other. Pricing can vary, but I’ve found Gatorfoam can get expensive quick and may break upwards of $75 a sheet, depending on your local contact. 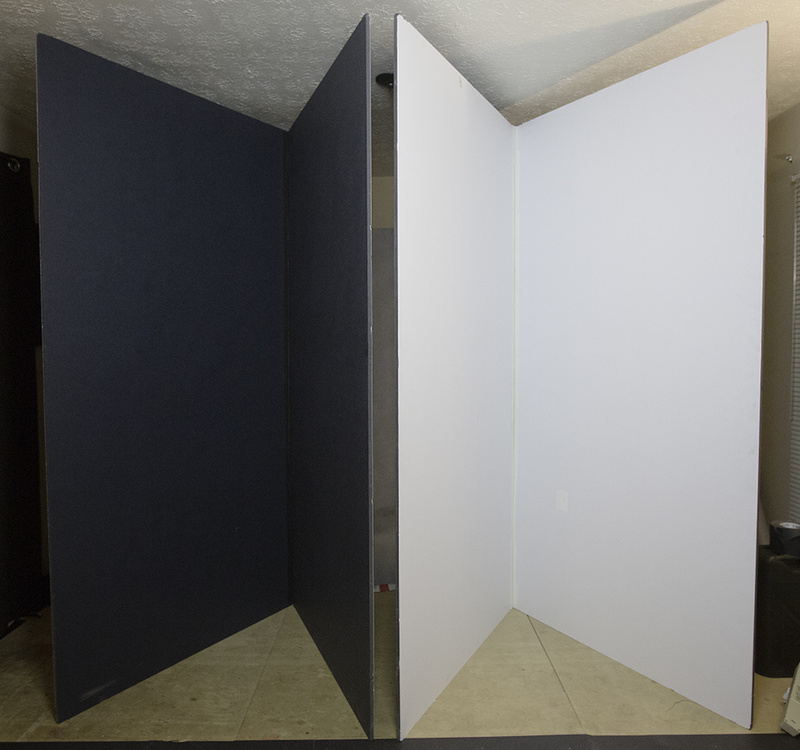 This is what I use and what I recommend: ½” 48” x 96” Black/White Reversible Gatorfoam. And, remember you will definitely need a big truck for transport. Once you have the necessary tools, let’s start from square one. Stack two of the flats side-by-side(with one board slightly higher than the other to reduce fold tension) both on the black side and clamp off both ends so they remain in place. 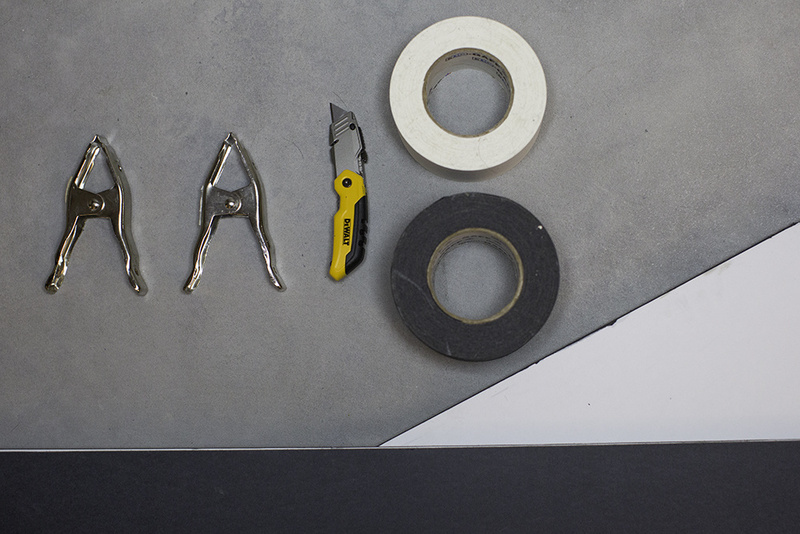 Run the Black gaff tape along the center of the length of both boards. Fold the tape over and seal to each side. Cut off any extra tape with the blade. Remove the clamps and flip the boards over to the white side. Run the white gaff tape along the center of the length of both boards. Fold the tape over and seal to each side. Cut any extra tape with the blade. Repeat this process with the other two flats. At this point, you may notice some tension when attempting to fold the two flats together. But, the beauty of gaff tape is that it can stretch. 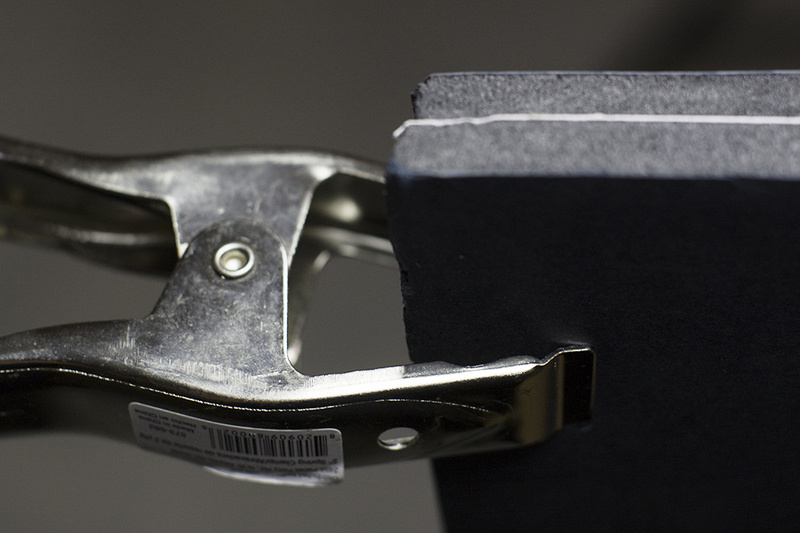 Slowly push the two flats together and the gaff tape should with stretch with the fold. The Gatorfoam will take the tension and not break under the pressure. Just like that, you’ve got some high-quality studio V-Flats. V-Flats are not only great for bouncing light and cutting light, but they are also great for building a set or using as a background. The matte white bounces light and is non-reflective, so it can be used as a solid seamless background resembling Savage paper. 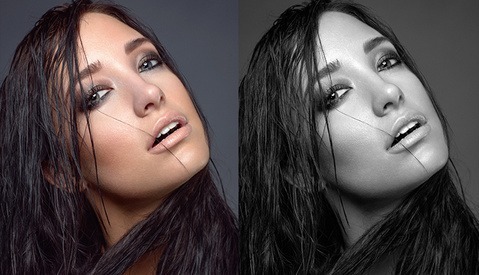 The black matte is great for cutting light and flagging light. I also use the black side of the V-Flats for background for not only my photos, but also for any live webcasts and podcasts. The versatility of V-Flats are endless and I feel as I have only scratched the surface of their use. I’m constantly finding new and inventive ways to use them, such as using them as flooring or creating background or even using them simply to create set separation, which gives the subject a private space. I’ve even found that they look good when they are included in the shot, which can create depth and dimension to the background. 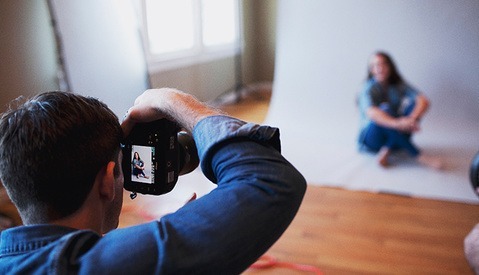 If you’re like me and shoot in a living room studio space, V-Flats can be a crucial tool to creating those beautiful portraits that we constantly long for. Make some calls, make the investment and I guarantee you won’t regret it. Thanks for reading Paul! Very awesome! very nice Gallery! Off to Lowes I go. I constantly shoot on location and foam v-flats never last very long. However, my current v-flats are made from cheap hollow doors (found at any home depot) with double jointed hinges. You have to cover them in some sort of fabric to seal up the crack (I used a painter's tarp), and then you paint them. They are heavier (though my small assistant— sorry Lindsey— can still easily move them), but infinitely more durable. They've been through hell, but are still going 7 years on. Right on, thanks for reading. Cool insight! Those sound like some durable V-Flats! JJ post a picture of those. I' would love to see what they look like :) Also...... another great article Clay! I'm out of the studio for the next couple of weeks, but I'll describe it for you. The doors are white, so after I hinged the two together, I fold them shut (like in this article). I then covered the outside of folded doors with a painters tarp, wrapping it all the way from one side to the other across the hinges. I think I ended up using contact cement to make it stick— the doors have a plastic laminate on them and it took a while to get something to adhere. I then trimmed the edges and painted it black with household paint. The other sides were already white, so I left them. The one main difference between these and the foam Vs, other than weight, is that the doors I used were each only 30in wide. Which means that you can use them for a backdrop on smaller items, but not people. BTW, I also left the door knob hole open on them. It makes it easy to loop a strap through them to keep them closed and to use as a handle to carry them. Thanks Matthew! Appreciate you reading! Thanks Lucas! Really appreciate that! Hold my beer. I can do this. I'm not sure why you spec'd two different widths of gaff tape, I'm sure that running 4" on both sides would be fine as well. I've always made them with 2" gaff, but I run three pieces on each side... one down the middle at the seam, and then one on the flat part of each board to give more strength (effectively creating a 5" wide piece of gaff). I imagine that 2" gaff is slightly more common to have lying around, so don't feel like you have to go buy special tape for this. 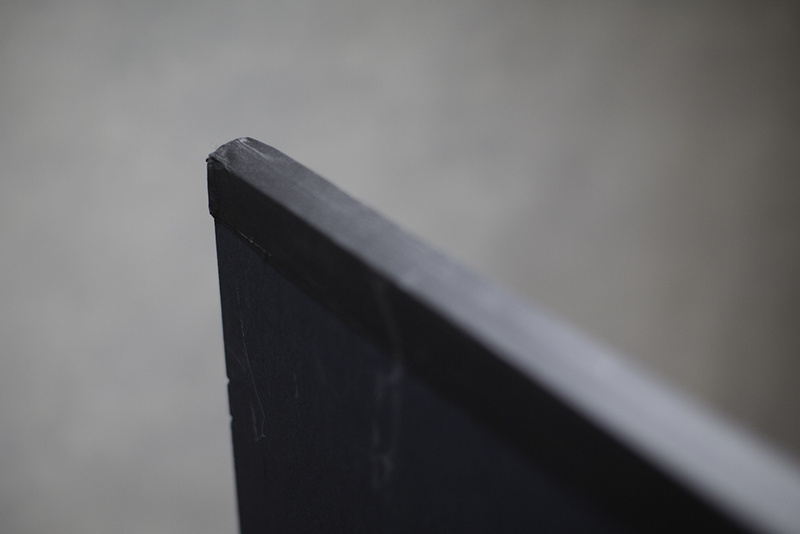 I would also highly recommend running another single piece of black 2" tape around every edge. As V-flats age, the edges are what tend to go first (from bumping into ceilings, walls, corners, etc). This extra protection will significantly prolong their life. Finally, I can't stress enough how much better flats built from 1/2" or 3/8" board are over flats build from thinner foam core. They last WAY longer, primarily because they are much less prone to warping and bending. As long as you are taking the time to put these things together, it is very worth going out of your way to get the thicker stuff. Thanks Brandon! From research, 3" white gaff tape was the widest I could find. Great recommendations here folks. Thanks again! Thanks for reading Steve! Appreciate that. Aluminum light panels can a good alternative. I have a Calumet one that's 42" by 78" with black, silver, white, and transparent fabrics. I wish it was taller, but it breaks down very easily into a small, lightweight package. I might buy a second one with clamps so it can fold like a v-flat. Right on Michael! Thanks for the alternative tips! I use foam-cor, but that's probably because the Set Shop in NYC is in my building. 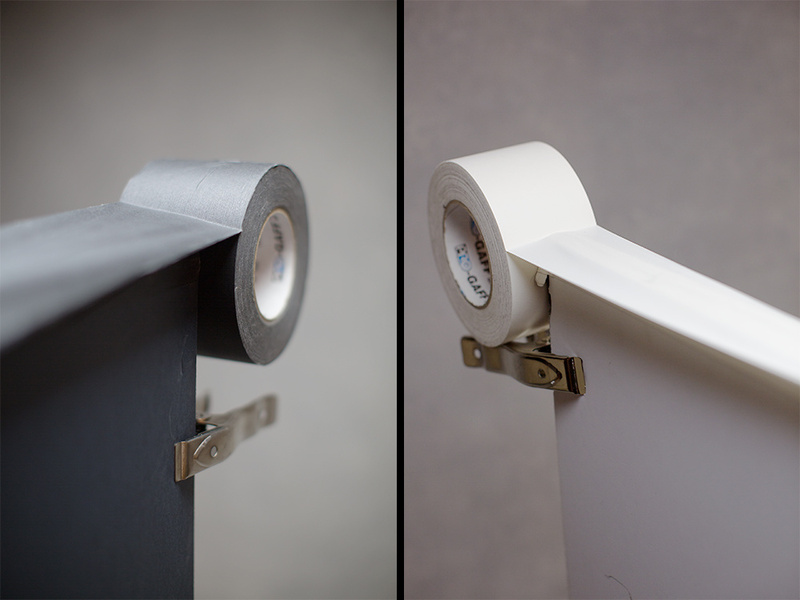 If you travel with the boards, you can tape around the entire edge, they'll hold up better. Run the white side first along the edge and cover the outside edge, then the black side along the edge and double up on the outside end. No need to comment on my post. 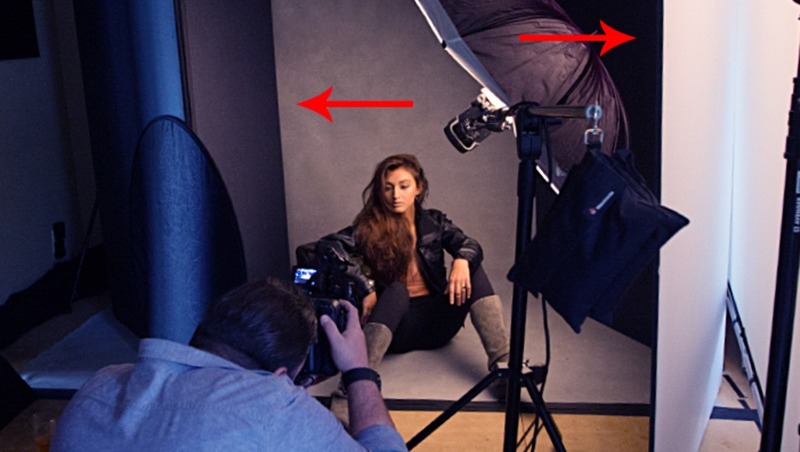 For the shots where you don't use the v-flats for a background, I don't understand why you need black v-flats unless the wall of your studio is right there reflecting light. Some with and without photos would be greatly helpful in showing the effects of a black v-flat. I can't speak for the author, but I use them as flags to keep spill from the background off the subject. You'd be surprised how much light is being reflected or wrapped around the subject. Firstly, thanks for reading! The black side of the V-Flat is to flag and cut light where I need it. Sorry I wasn't clearer on that! Very useful tutorial. Practical and easy to follow. Nice work! Thanks Phil! Really appreciate that!